The allure of a Friday night for teens and young adults is palpable. It’s a time to celebrate the end of a long week, hang out with friends and anticipate the weekend ahead. Fridays in the fall also include the social experience that is high school football. 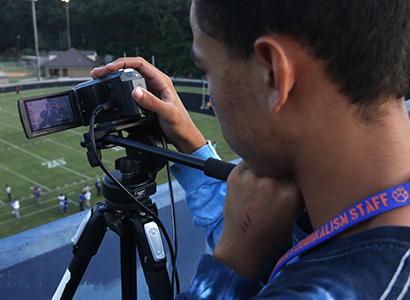 For a group of Cedar Shoals High School students and Grady Sports Media students this fall, Friday nights are an opportunity to come together and dedicate their time toward new skills that could become future careers—sports broadcasting. The opportunity comes courtesy of “The UGA-Grady High School Sports Broadcast Program.” Grady Sports Media faculty members created the program after receiving one of the University of Georgia’s New Approaches to Promote Diversity and Inclusion Grants earlier this year. The grants are intended to support the recruitment, retention and success of underrepresented, underserved and first-generation students at UGA. The sports broadcast program pairs high school students with Grady Sports Media students in an intensive training and on-the-job learning experience. 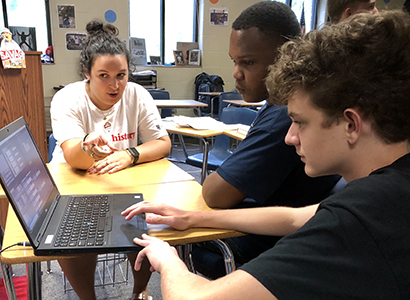 Since the beginning of the school year, Grady Sports Media students have traveled to Cedar Shoals a few times a month for after-school training sessions focusing on all parts of sports broadcast journalism, from producing and camera work, to play-by-play announcing, building in-game graphics and tracking game statistics. Friday nights are spent in the stadium press box where the high school students, under the leadership of the college students, practice what they have learned by producing a live broadcast of Cedar Shoals football games. The dedication that these students have put into the program with the hours of after-school training and the five-hour or more time commitment on Friday nights is the most impressive part of the program according to Marc Ginsberg, Cedar Shoals journalism advisor. That is testimony to the early success of the program. “We are grateful that this idea we’ve had in our minds for a while is coming to fruition because of this grant,” said Vicki Michaelis, the John Huland Carmical Chair in Sports Journalism and Society and the director of Grady Sports Media. All UGA undergraduates are eligible to apply for the six-course Grady Sports Media Certificate program, which launched in 2014. 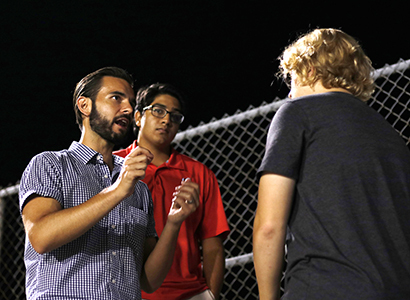 The Grady Sports professors have noticed that students who graduate from resource-rich high schools, many with their own sports broadcast programs, have an edge in experience and overall awareness of possible career paths in sports media. They want to bridge that gap for students from under-resourced and underrepresented communities. Coupled with the fact that Grady Sports Media educates students for an industry in need of a diverse workforce, they saw an opportunity. “From a system that’s feeding into our program, to a system that we are feeding into, we saw a real need to have this connection,” Michaelis said. 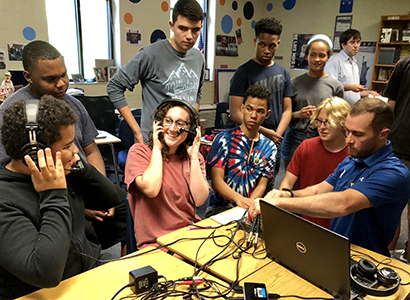 Michaelis and Carlo Finlay an academic professional and assistant director of Grady Sports Media, are using the grant to develop training modules and to buy a two-camera, high-definition broadcast kit that Cedar Shoals High School will be able to keep. They have also enlisted the help of other strong partners such as the NFHS Network, an online platform that broadcasts high school sports nationwide. The Cedar Shoals student broadcasts this fall are being live-streamed on the Grady Sports Media channel on the NFHS Network. The NFHS Network also loaned Cedar Shoals a starter broadcast kit, including a camera, switcher, headsets, microphones and cables, and provided initial equipment training. 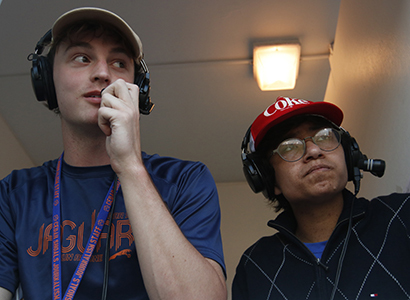 Anyone who has been around teenagers knows that it can be a challenge to engage them in new activities, but participation at Cedar Shoals has been strong for the UGA-Grady High School Sports Broadcast Program. When Ginsberg asked for volunteers to participate from his yearbook, newspaper and other broadcast classes, he wanted to make sure he had committed students who were dedicated to the program and would make it a priority. He had about 20 students volunteer. He divided the group into two production teams, so that they don’t have to work every game and can enjoy the pleasures of rooting for the team from the bleachers. “They have worked their butts off so far,” Ginsberg admits proudly of his volunteers. The production teams have to report to the stadium 2-1/2 hours before kickoff, but their responsibilities begin early in the week by researching background on the opponents, writing the scripts for their opens, building graphics and other prep work. The students take turns each week with their assignments. A genuine interest in media is something that Finlay noticed when he first met the students. Ginsberg claims his keys to success have been to “start with an open mind and be flexible at first.” When Michaelis and Finlay first approached him about participating in the program, he was hesitant, but once he was reassured that there would be training and teacher support from Grady Sports Media, he was all in. “It’s cool to be able to provide them experience where they kind of have to independently problem-solve in real time for an audience,” Ginsberg said of his students. For Cedar Shoals junior Victor Soto-Rosales, he sees this as an investment in his future. He aspires to attend the University of Georgia and major in journalism or film. He admits the program is tougher than he thought, but it has its advantages. It’s a love of journalism that attracted junior Emma Dowling to the sports broadcast program. She gladly gives up her Friday nights to learn something new, including some hard lessons like struggling for an internet connection right before going on the air. One of the biggest surprises for most involved with the program is the close connection developing between the high school students and the Grady Sports Media students. That connection started after the first training session. When the camera operation lessons were done, the high school students started asking Myan Patel and Taylor Maggiore, two of the four Grady Sports Media students working with the Cedar Shoals students, about college. Patel and Maggiore are third-year journalism majors and they are each working toward earning Grady Sports Media certificates. It was their work with the Grady Sports Bureau (which produces local high school sports broadcasts) last fall, and the fact that they are not far removed from their high school years, that made them well-suited for the high school program. Maggiore spent last summer as a UGA orientation leader, so she is prepared to answer questions about college, and the Cedar Shoals students enjoy talking with Patel about his internship last summer doing play-by-play announcing and beat writing for collegiate baseball. “It’s really invaluable to see someone doing something that’s exciting and fun who is not that much older than you,” said Michaelis of the dynamic between her students and the Cedar Shoals students. The Grady Sports Media students, with guidance from Michaelis and Finlay, have conducted all the training sessions with the students and they are there to answer questions and provide moral support during the football games. According to Soto-Rasales, the time the Cedar Shoals students get to spend with the Grady Sports Media students is one of his favorite parts of the program. Patel says the expectation of the future of the program is the biggest reason he is involved.